Well, it’s hard to blame PV for her behaviour after all what she learned. Still it’s kind of sad that Socket would have thoughts like that. On a bright side, PV is not mad at her so… As soon as PV get her thoughts in order it will be fine. Now let’s just hope there isn’t another Godzilla wannabe approaching the city. Hahaha, ah, I’m just excited to see what happens next. Commander: So, what have we learned from this event? Pivot: That flux has a goddamn particle cannon that can kill a fully grown kaiju in one comic page? Commander: Other than that. And what the hell do you mean by one comic page? I would’ve understood that immediately, but I saw the 24-hour clock standard. I also could’ve read that as 1:00 PM instead. “In one hour” would have been better, honestly. Personally I like the 0100 notation more. Considering those are robots and androids we are talking about it would be reasonable to assume they would use as efficient system to store information on time as possible. And you can get hardly more efficient than “0100” without being ambiguous. Similarly I’d expect them to use 24-hours system as it’s strictly speaking more data-efficient and far more easier to actually code down. That is, if things like personality cores are still “just” really big streams of “zeroes” and “ones” but that’s for Zedrin to confirm or debunk. Maybe I’m just not comfortable with the 0100 thing considering they’re not exactly military. 2. The warning systems were sabotaged. 3. 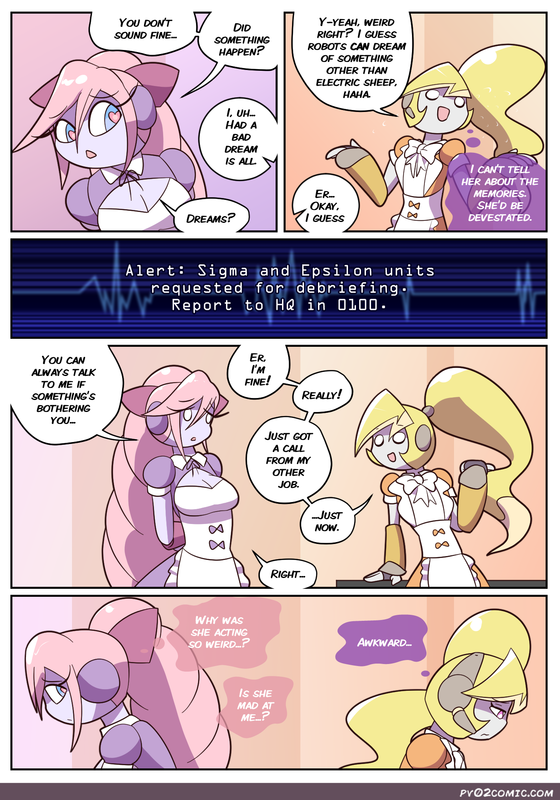 Ominous robot hackings and malfunctions. 4. Additional intel from Ms. Relay regarding Dagonian reports. 5. The IFS will work with Viligence, that could mean Axle may join Pivot’s Epsilon team. Yo Z, big mood lately my dude. My boyfriend and I are exactly like this. We keep having long conversations inside our own heads and start thinking the other hates us or somesuch and it just turns out to be stress over a “The Bad Parent™” asking for money or something similar. Actually all of this comic is big mood infact. All its missing is one of the main cast questioning their gender identity consistently. I hate when webcomics relate to my real life. I hate it, keep up the good work.